Kenya's Vivian Cheruiyot and Moses Kipsiro of Uganda win the women's and men's elite races at the 25th annual Great South Run through the streets of Portsmouth. Cheruiyot was 17 seconds outside the course record with a time of 51 minutes 17 seconds, while Kipsiro clocked a time of 46 minutes in the 10-mile (16km) race. 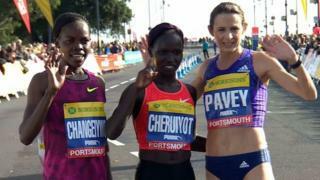 Jo Pavey, the reigning European 10,000m champion and two-time winner of the Great South Run, came second in the women's race with a world-over-40 best time of 52 minutes 44 seconds.